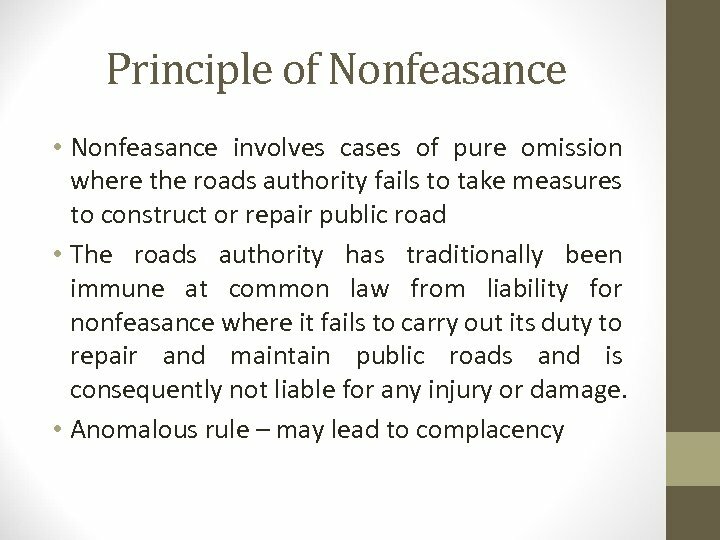 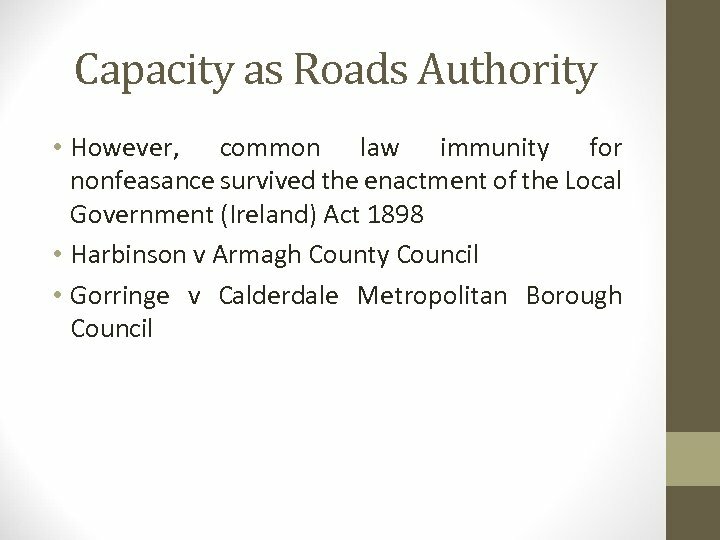 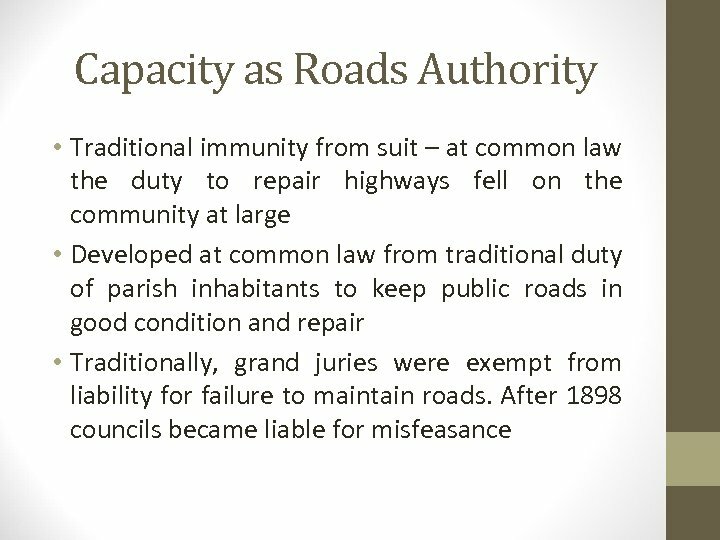 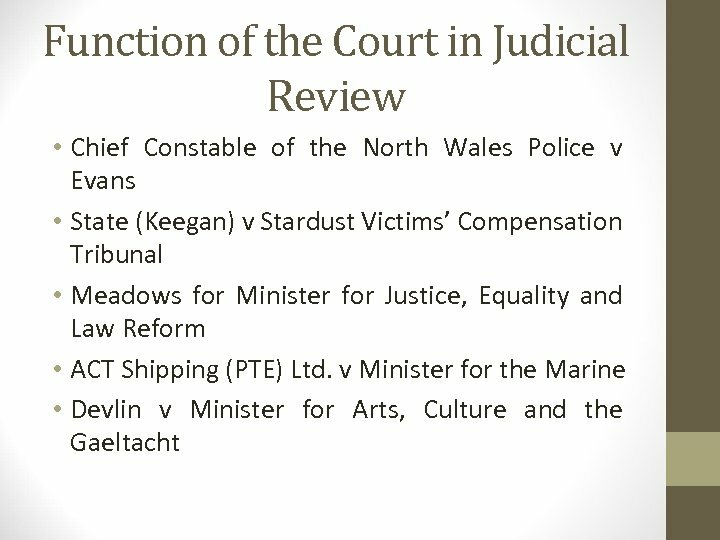 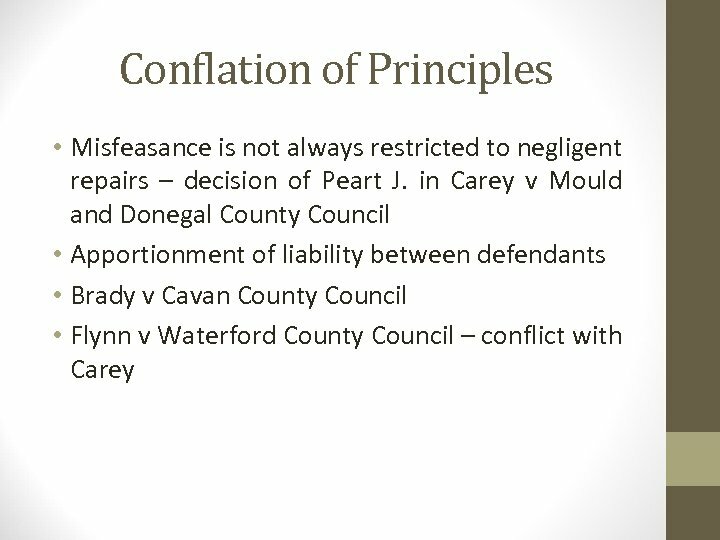 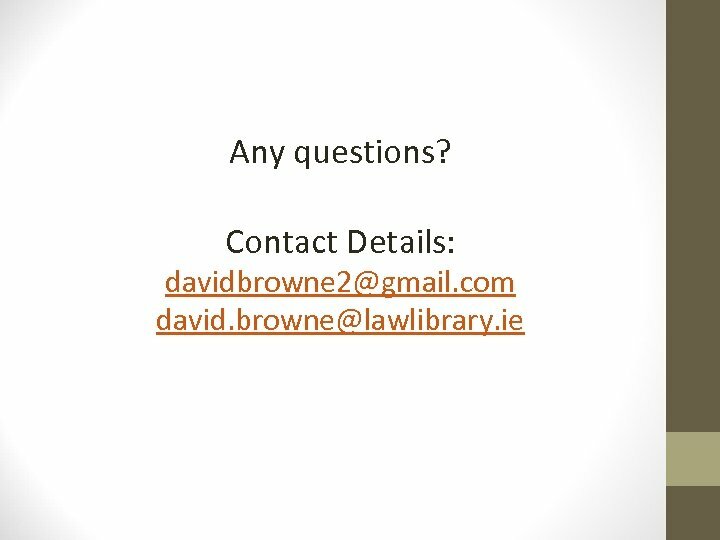 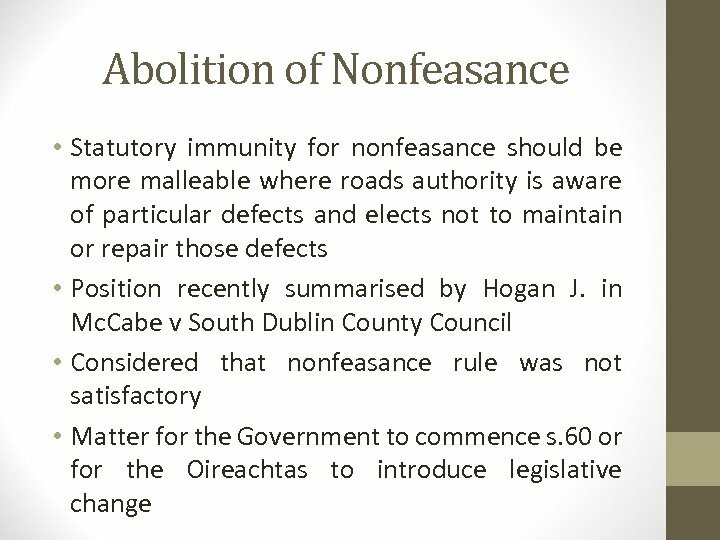 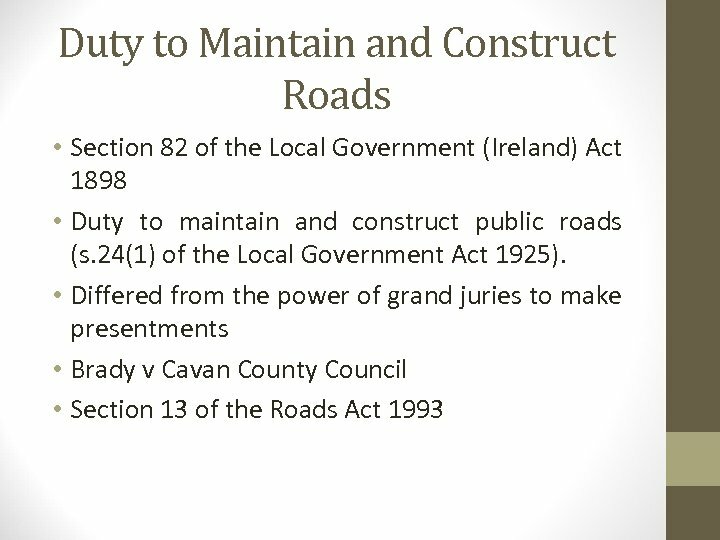 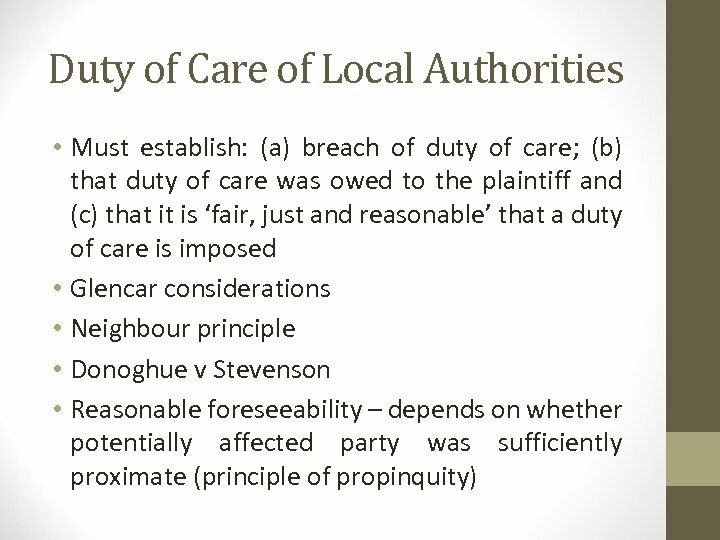 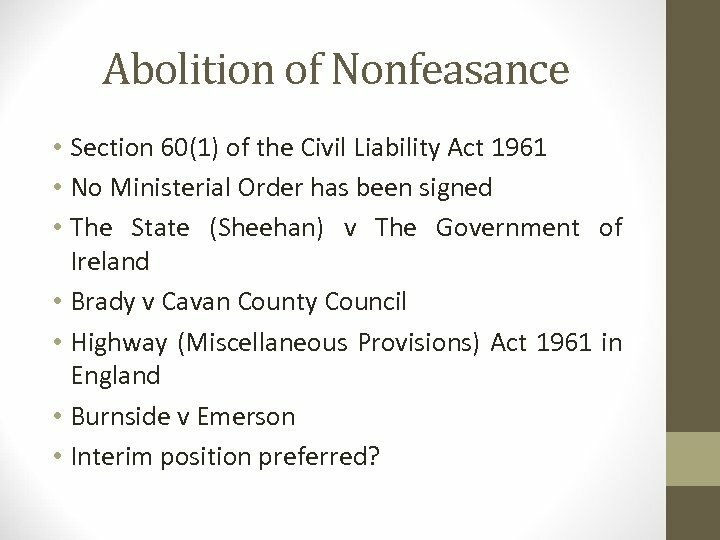 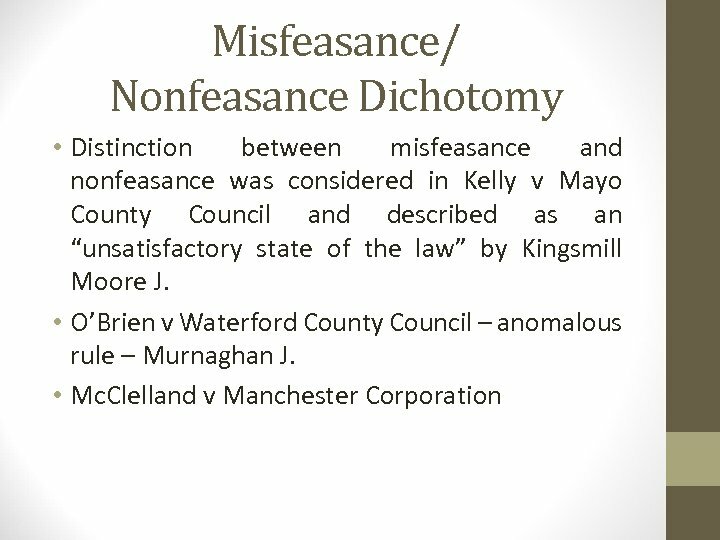 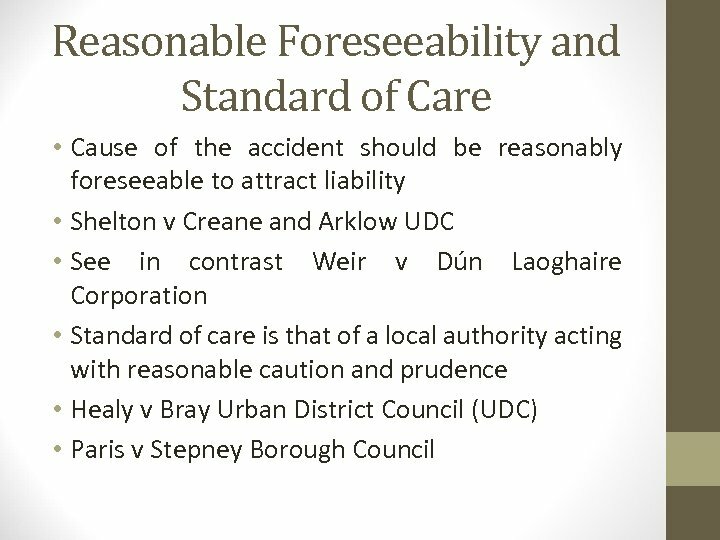 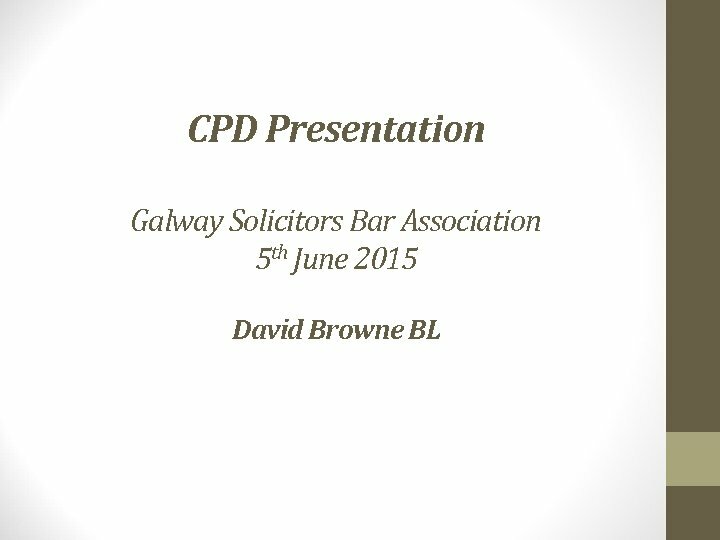 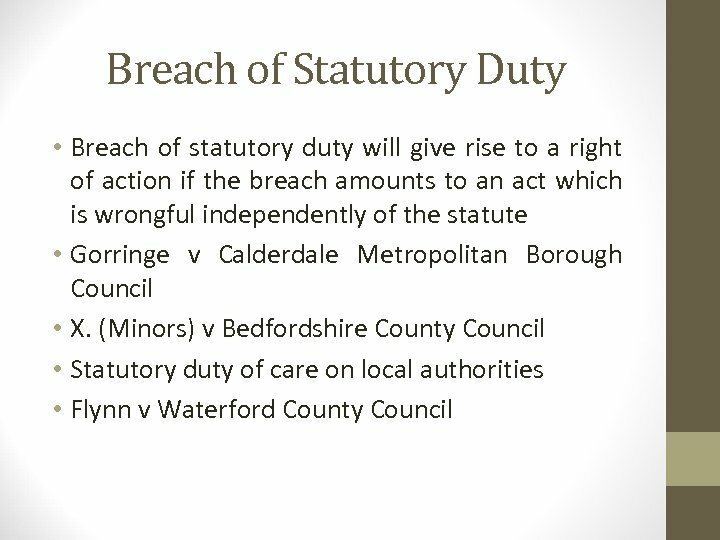 Abolition of Nonfeasance • Section 60(1) of the Civil Liability Act 1961 • No Ministerial Order has been signed • The State (Sheehan) v The Government of Ireland • Brady v Cavan County Council • Highway (Miscellaneous Provisions) Act 1961 in England • Burnside v Emerson • Interim position preferred? 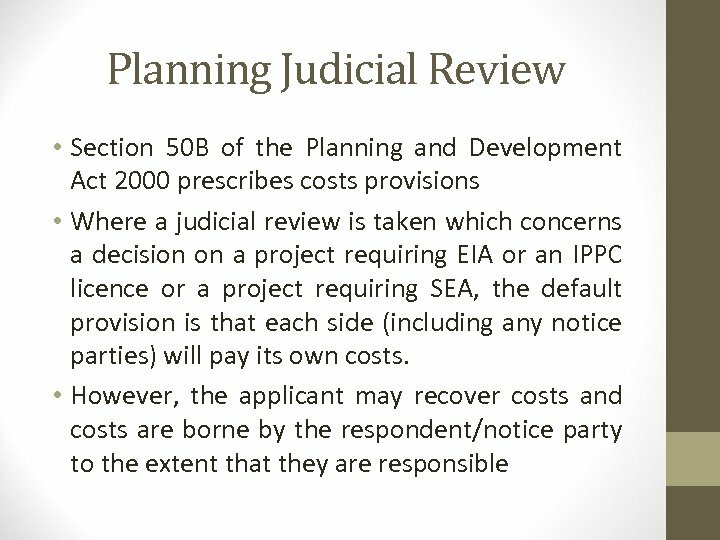 Planning Judicial Review • Section 50(6) of the Planning and Development Act 2000 provides that an application for leave to apply for judicial review must be made to the High Court within eight weeks of the decision. 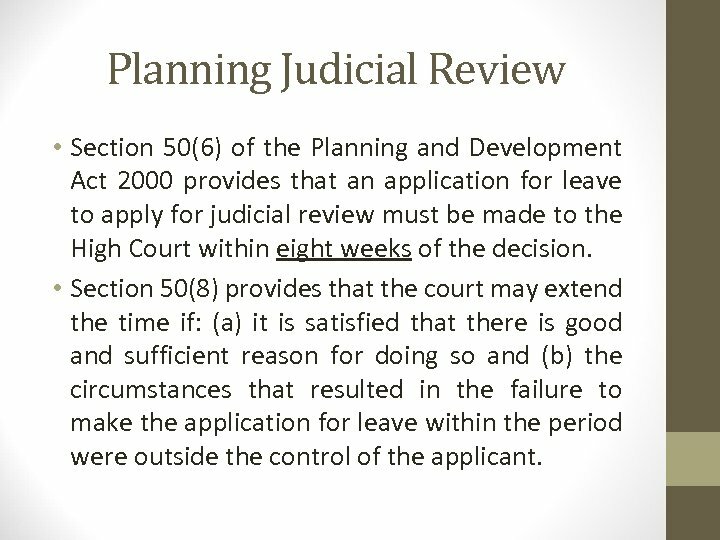 • Section 50(8) provides that the court may extend the time if: (a) it is satisfied that there is good and sufficient reason for doing so and (b) the circumstances that resulted in the failure to make the application for leave within the period were outside the control of the applicant. 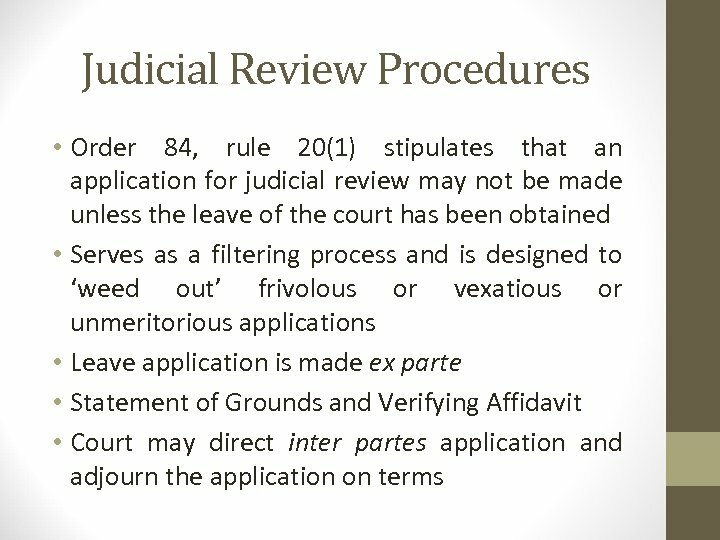 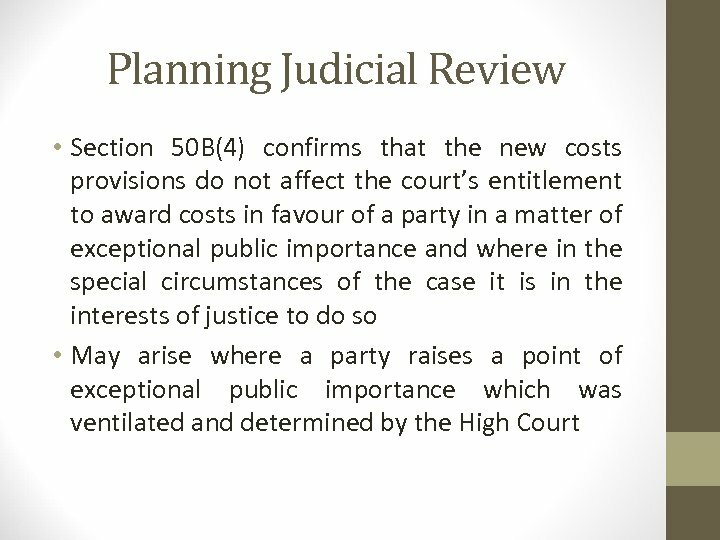 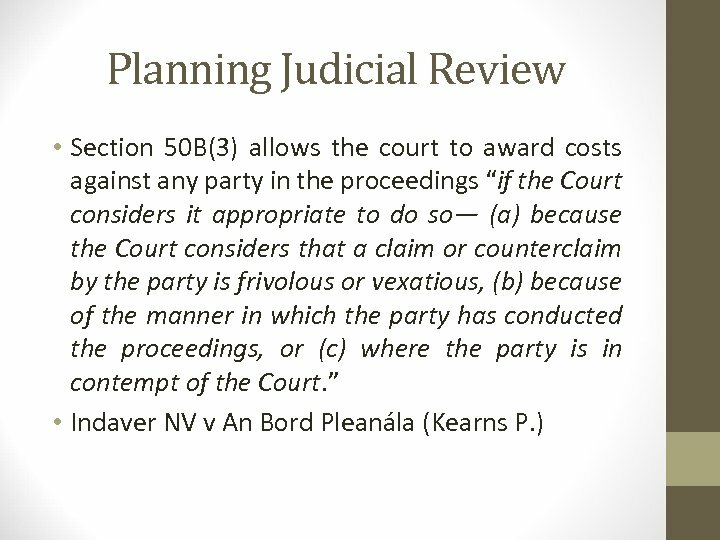 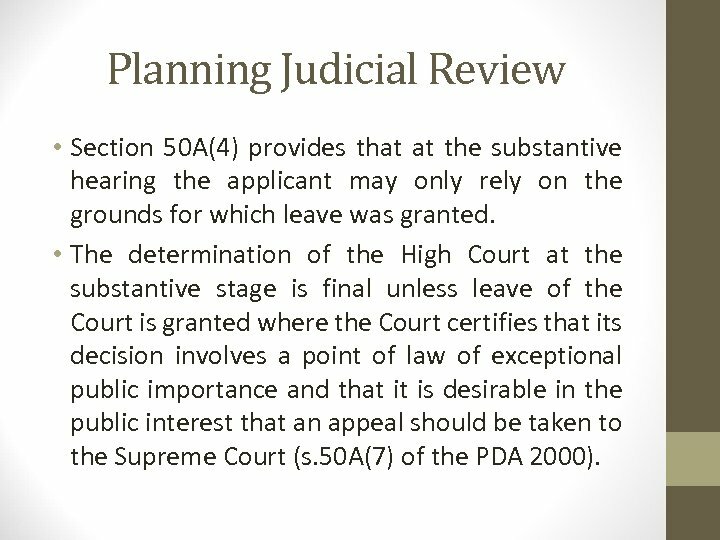 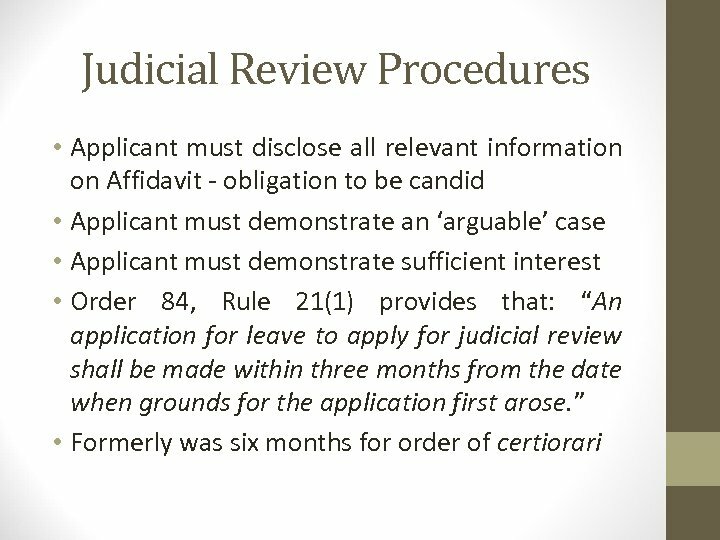 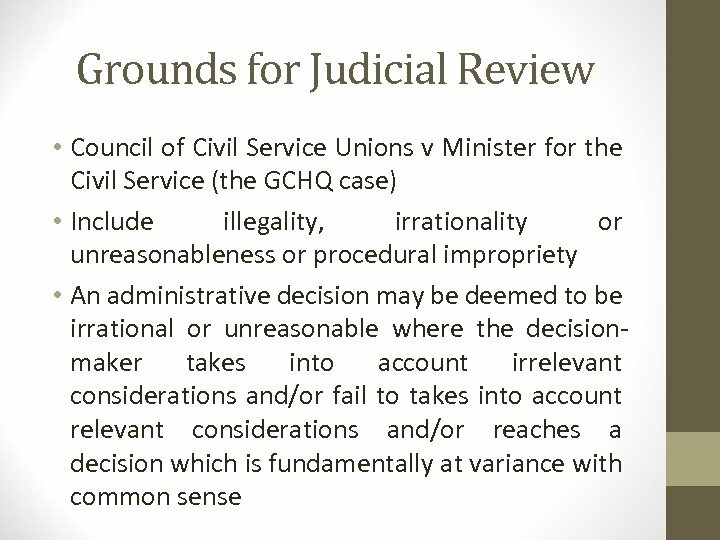 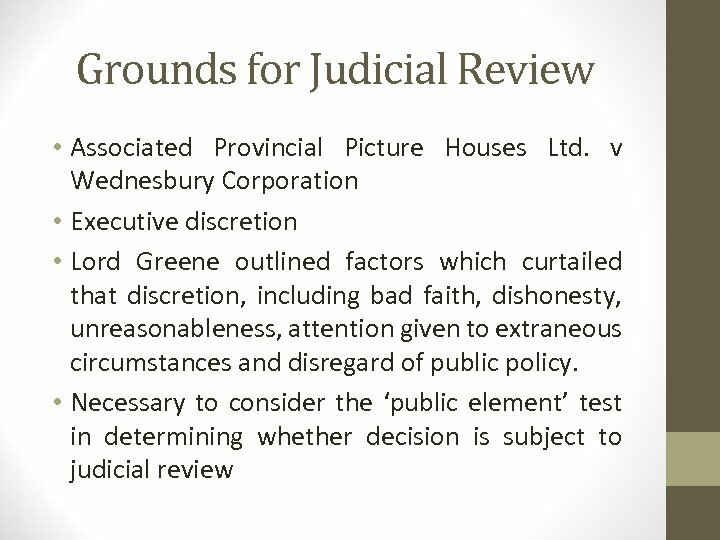 Planning Judicial Review • Section 50 A(4) provides that at the substantive hearing the applicant may only rely on the grounds for which leave was granted. 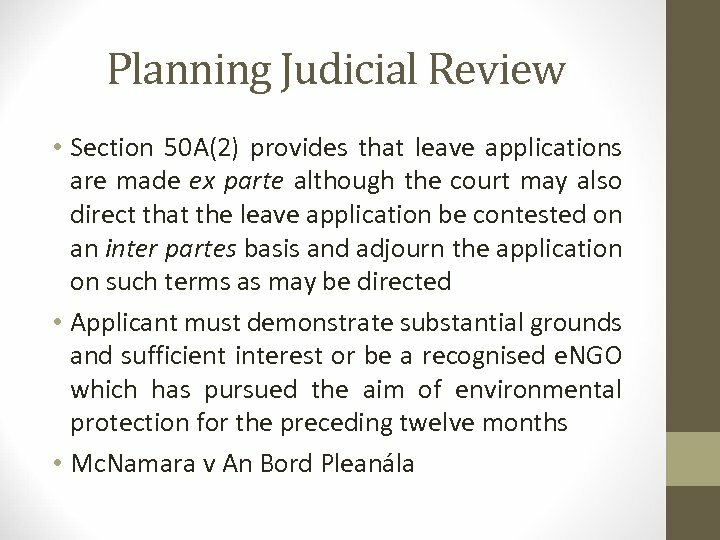 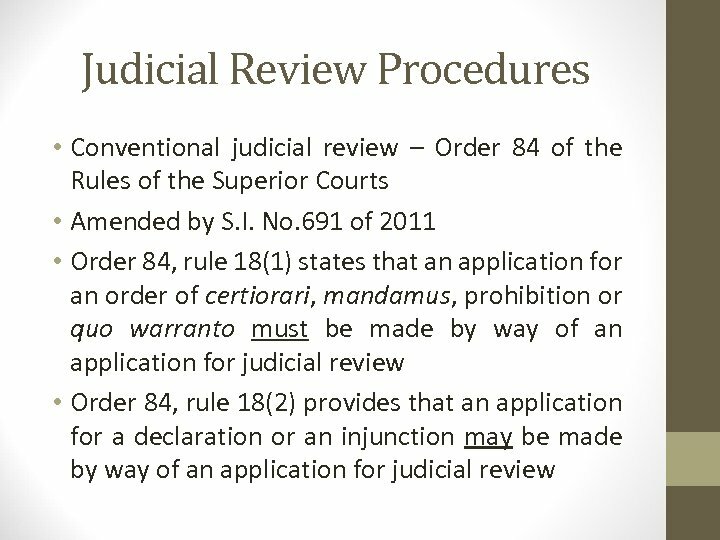 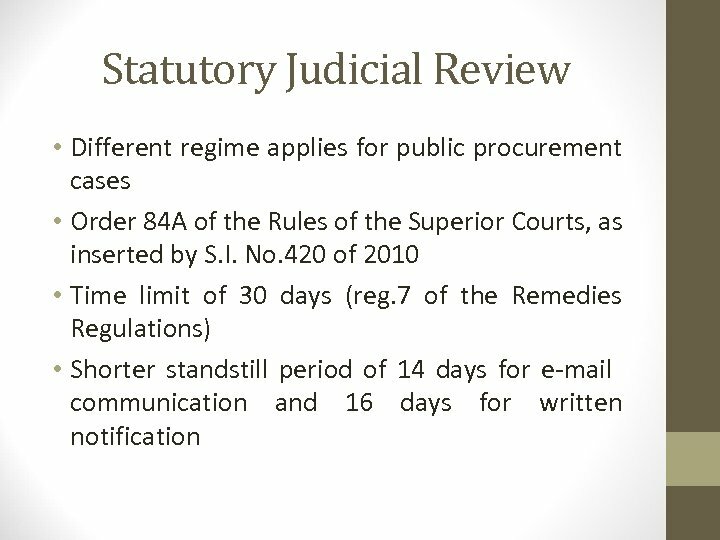 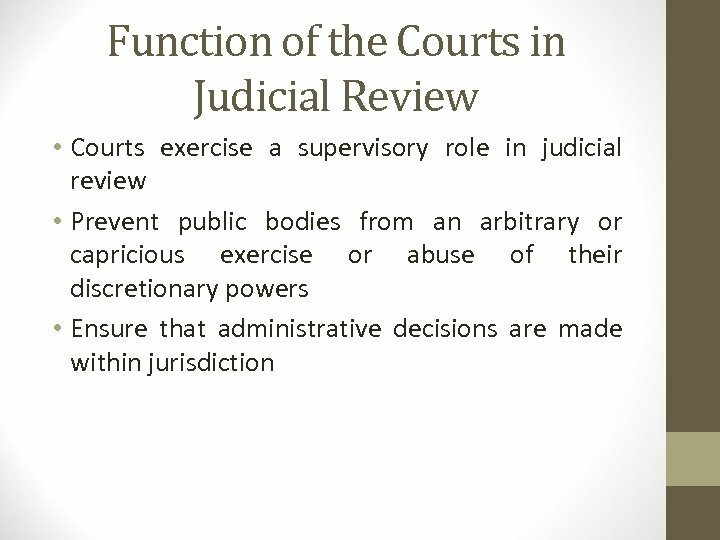 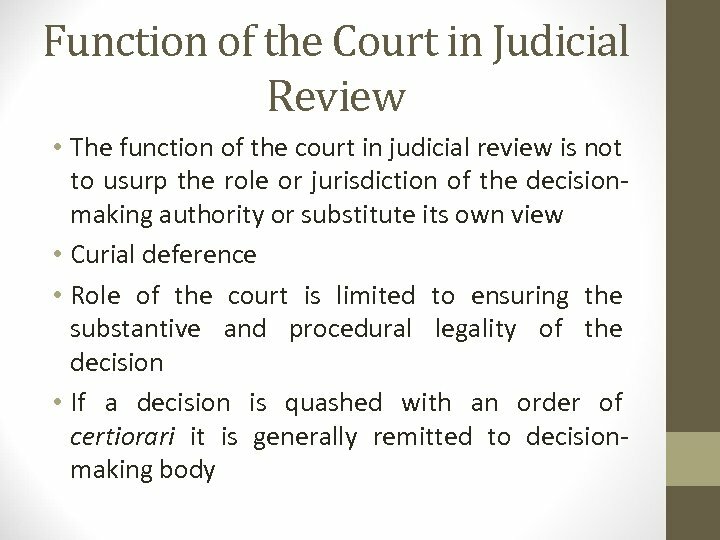 • The determination of the High Court at the substantive stage is final unless leave of the Court is granted where the Court certifies that its decision involves a point of law of exceptional public importance and that it is desirable in the public interest that an appeal should be taken to the Supreme Court (s. 50 A(7) of the PDA 2000). 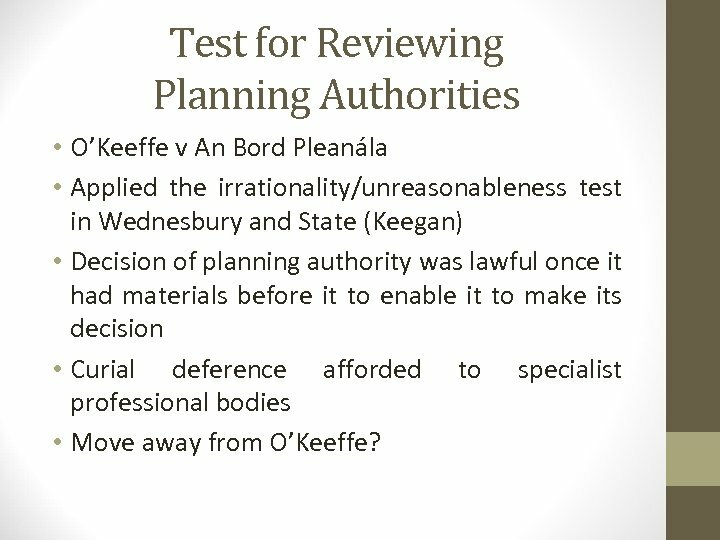 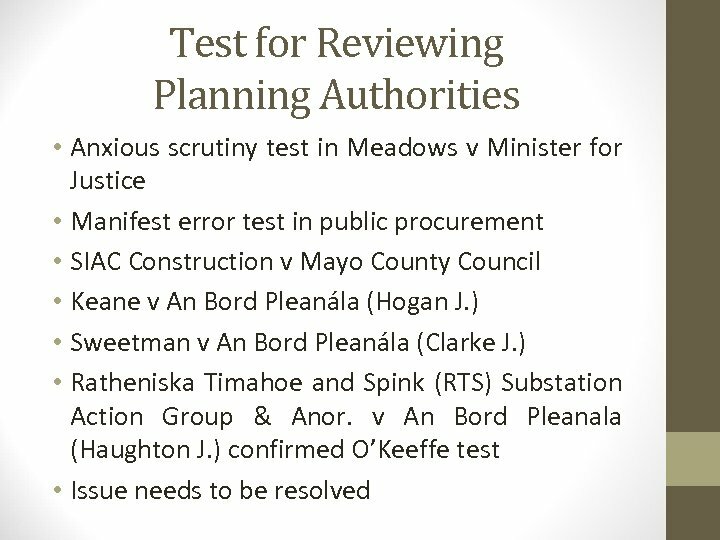 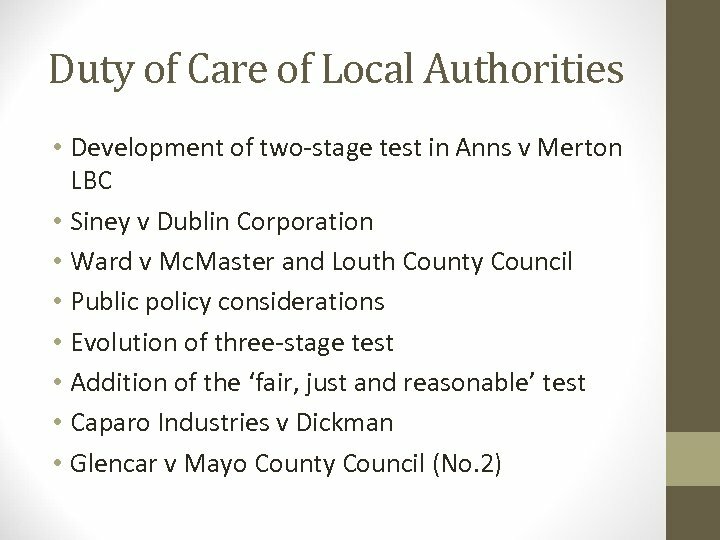 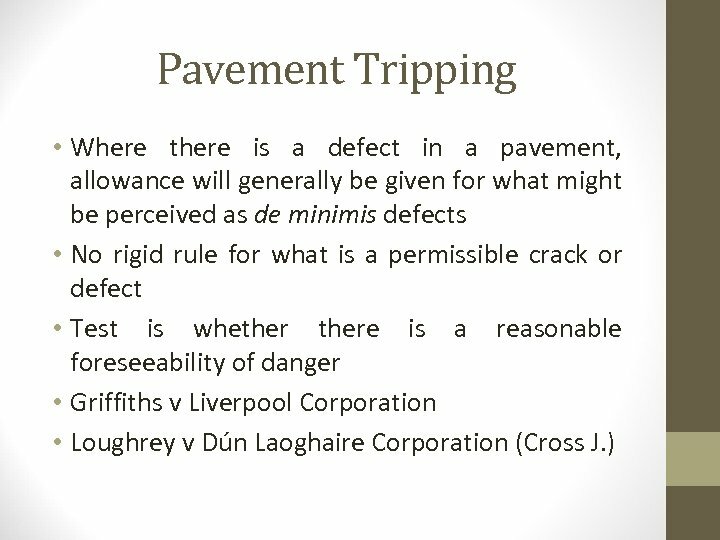 Test for Reviewing Planning Authorities • O’Keeffe v An Bord Pleanála • Applied the irrationality/unreasonableness test in Wednesbury and State (Keegan) • Decision of planning authority was lawful once it had materials before it to enable it to make its decision • Curial deference afforded to specialist professional bodies • Move away from O’Keeffe? 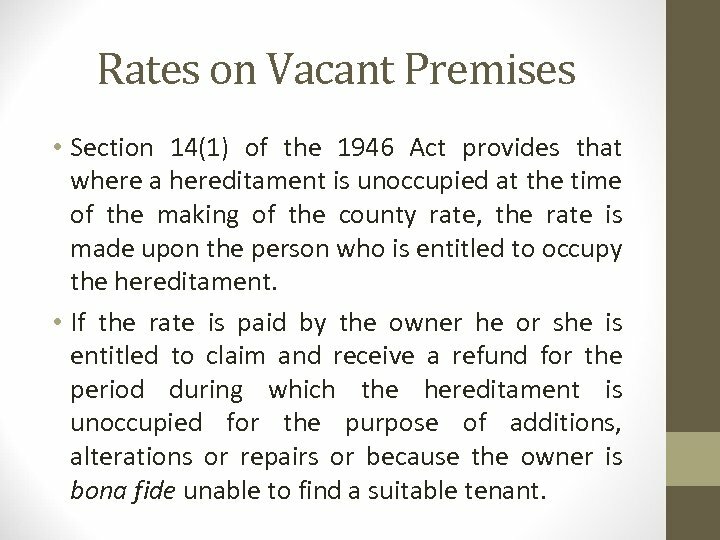 Rates on Vacant Premises • Section 14(1) of the 1946 Act provides that where a hereditament is unoccupied at the time of the making of the county rate, the rate is made upon the person who is entitled to occupy the hereditament. 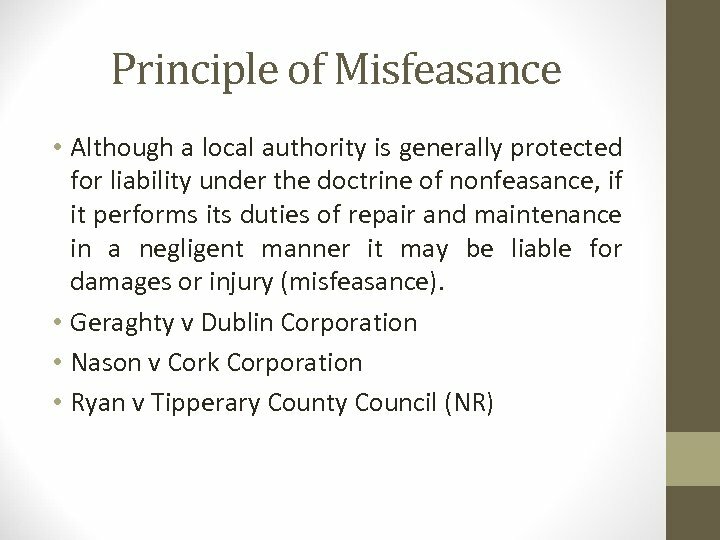 • If the rate is paid by the owner he or she is entitled to claim and receive a refund for the period during which the hereditament is unoccupied for the purpose of additions, alterations or repairs or because the owner is bona fide unable to find a suitable tenant. 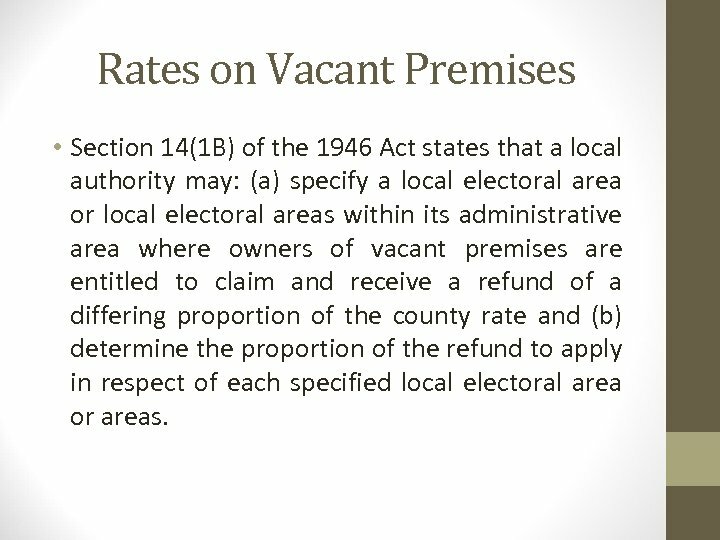 Rates on Vacant Premises • Section 14(1 B) of the 1946 Act states that a local authority may: (a) specify a local electoral area or local electoral areas within its administrative area where owners of vacant premises are entitled to claim and receive a refund of a differing proportion of the county rate and (b) determine the proportion of the refund to apply in respect of each specified local electoral area or areas. 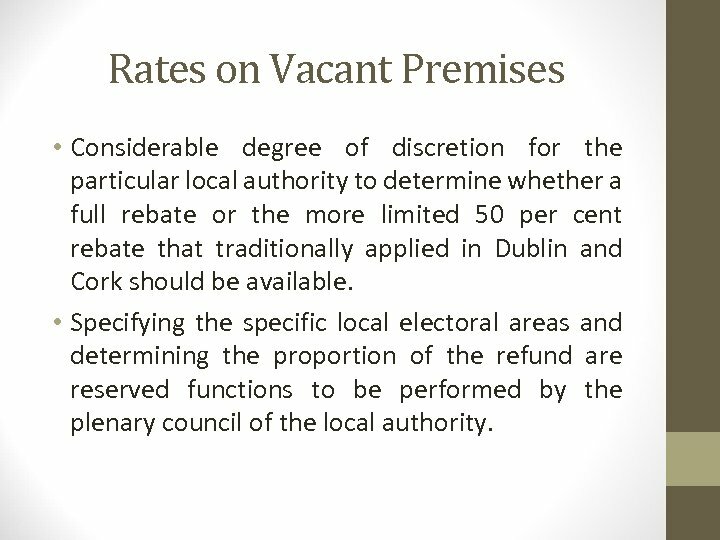 Rates on Vacant Premises • Considerable degree of discretion for the particular local authority to determine whether a full rebate or the more limited 50 per cent rebate that traditionally applied in Dublin and Cork should be available. 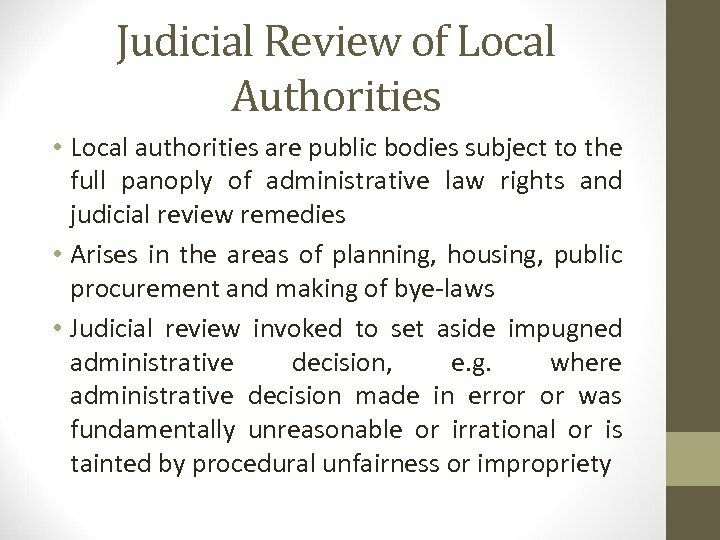 • Specifying the specific local electoral areas and determining the proportion of the refund are reserved functions to be performed by the plenary council of the local authority. 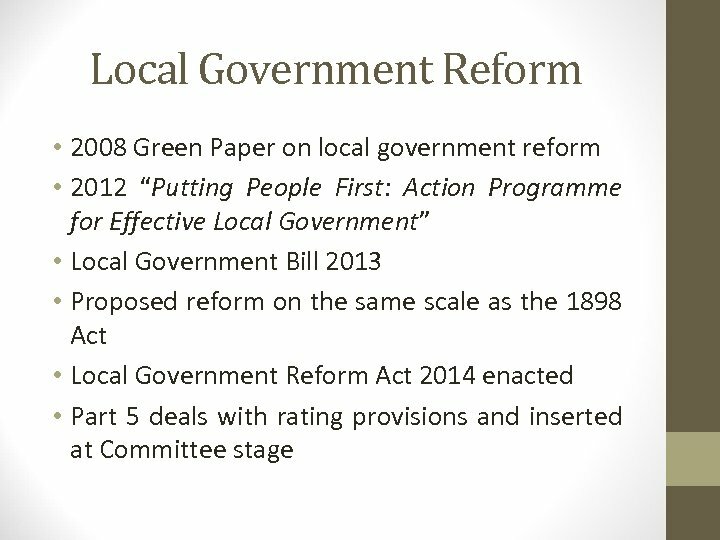 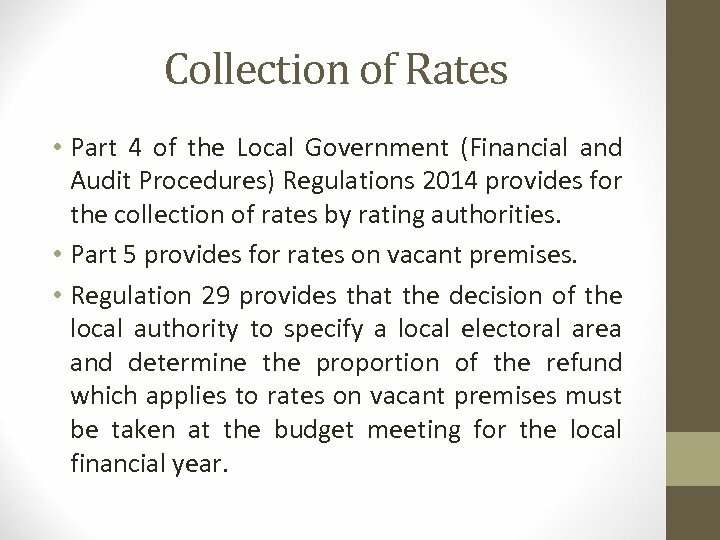 Collection of Rates • Part 4 of the Local Government (Financial and Audit Procedures) Regulations 2014 provides for the collection of rates by rating authorities. 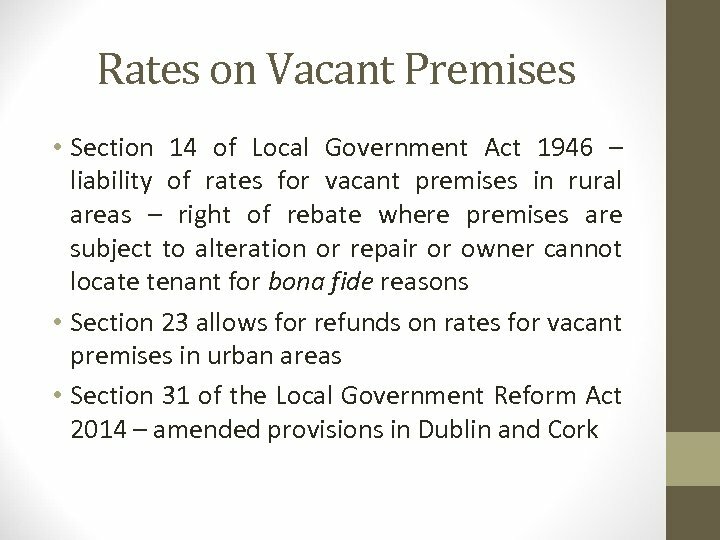 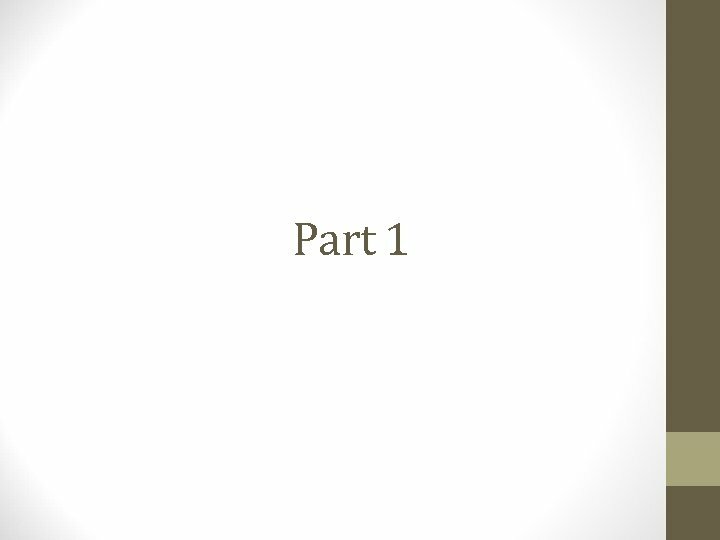 • Part 5 provides for rates on vacant premises. 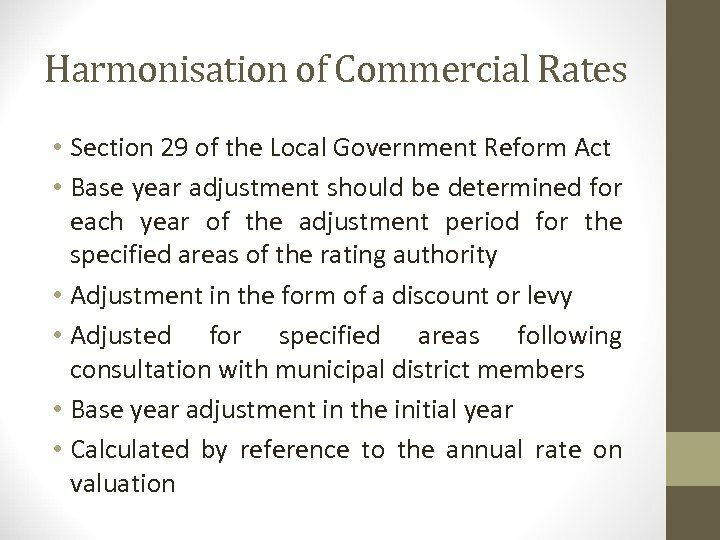 • Regulation 29 provides that the decision of the local authority to specify a local electoral area and determine the proportion of the refund which applies to rates on vacant premises must be taken at the budget meeting for the local financial year. 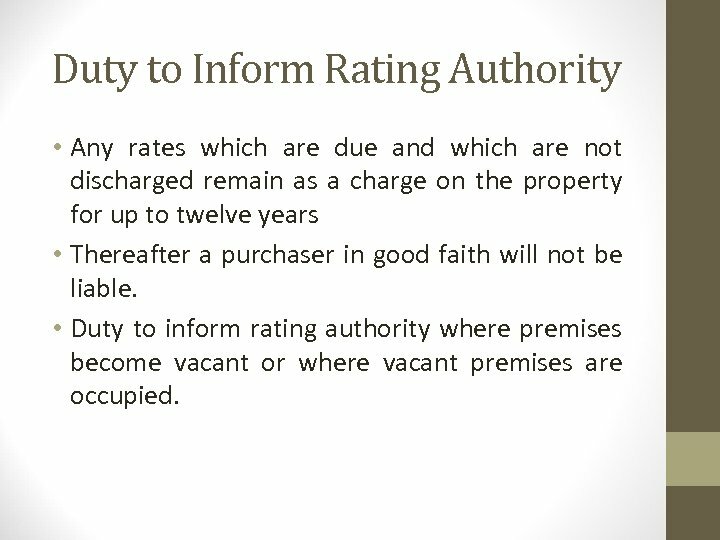 Duty to Inform Rating Authority • Any rates which are due and which are not discharged remain as a charge on the property for up to twelve years • Thereafter a purchaser in good faith will not be liable. 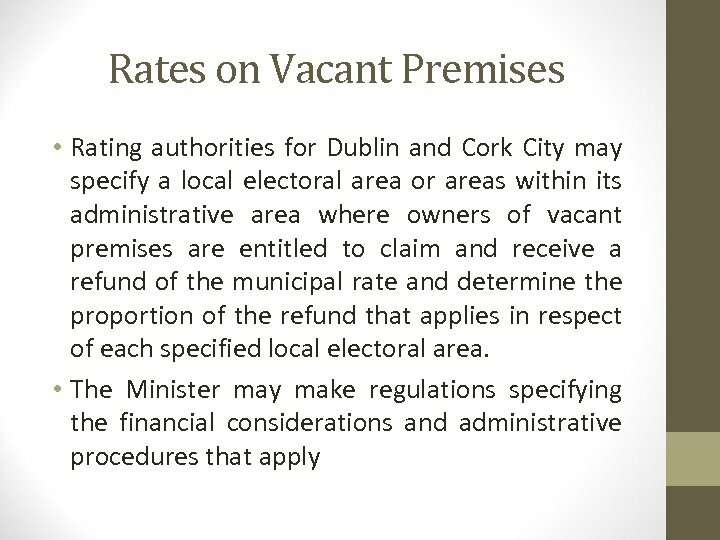 • Duty to inform rating authority where premises become vacant or where vacant premises are occupied. 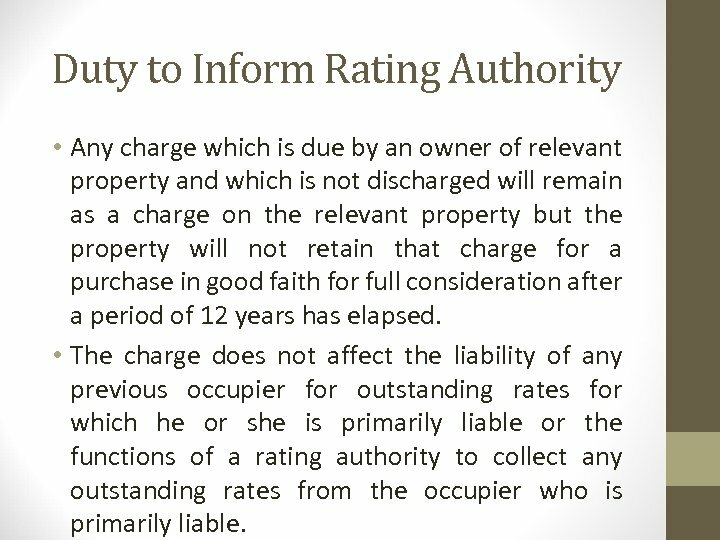 Duty to Inform Rating Authority • Owner of relevant property is liable for a charge which is equivalent to no more than two years of outstanding rates which are due from the previous occupier(s) where the owner has notified the rating authority in writing of a transfer of relevant property or interest in relevant property and the person transferring the property has failed to discharge all the rates for which he or she is liable. 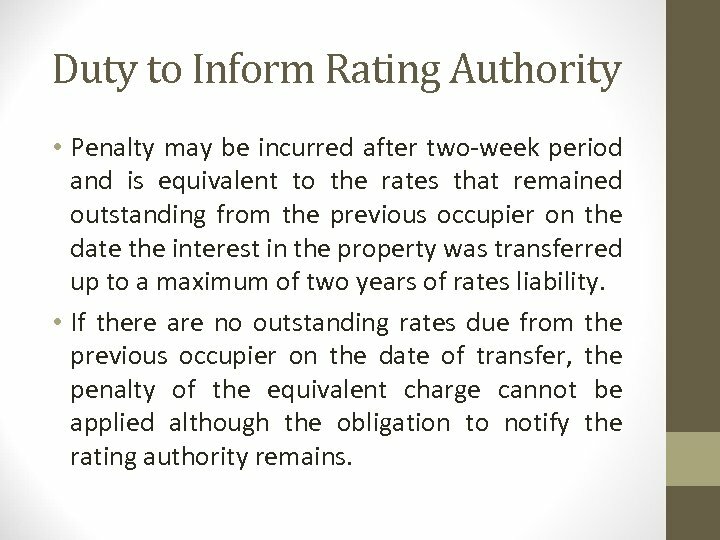 • Penalty arises after the expiration of the twoweek period following the date of transfer. 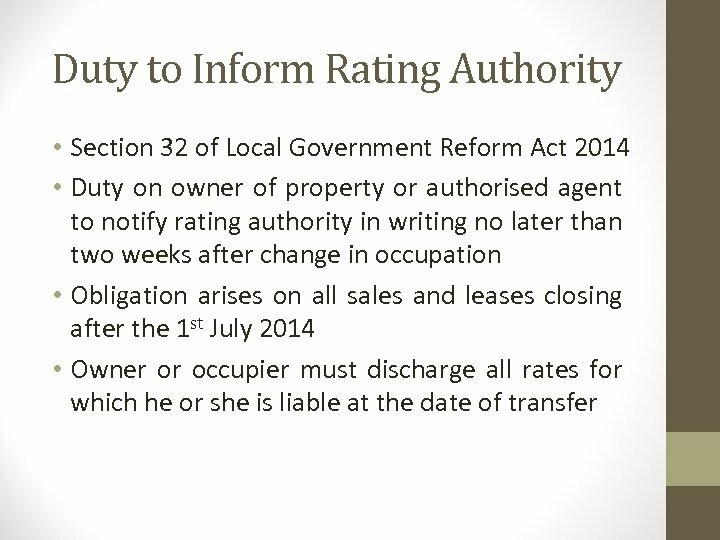 Duty to Inform Rating Authority • Penalty may be incurred after two-week period and is equivalent to the rates that remained outstanding from the previous occupier on the date the interest in the property was transferred up to a maximum of two years of rates liability. 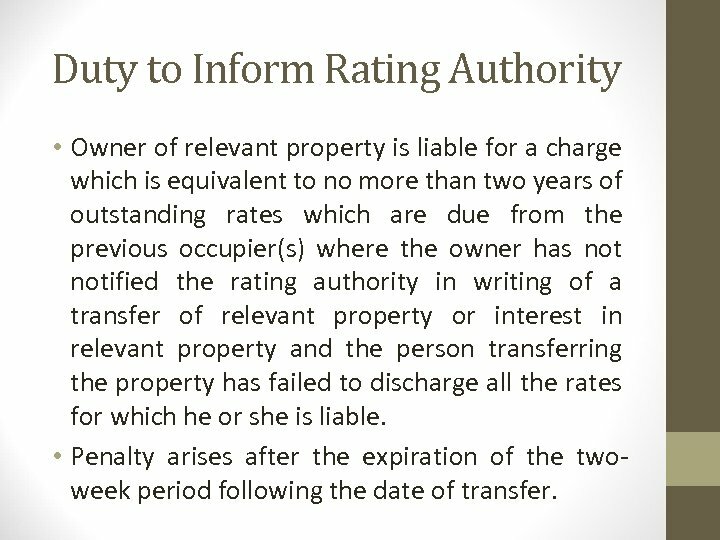 • If there are no outstanding rates due from the previous occupier on the date of transfer, the penalty of the equivalent charge cannot be applied although the obligation to notify the rating authority remains. 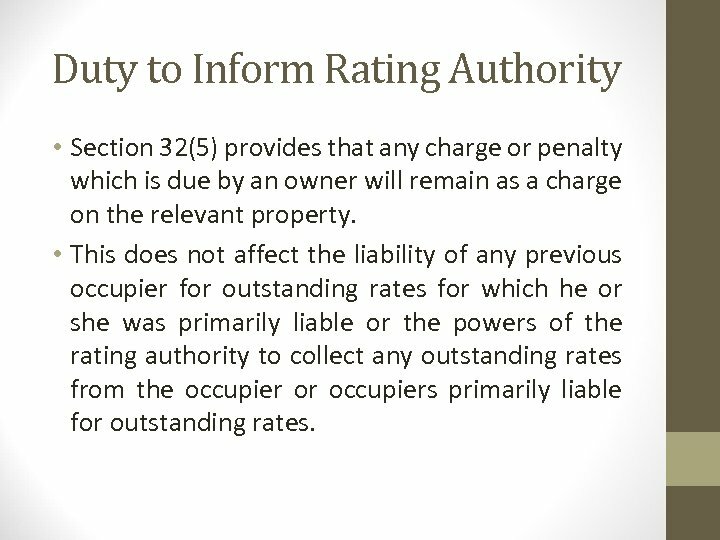 Duty to Inform Rating Authority • The penalty/equivalent charge is not affected by the subsequent payment of the outstanding rates. 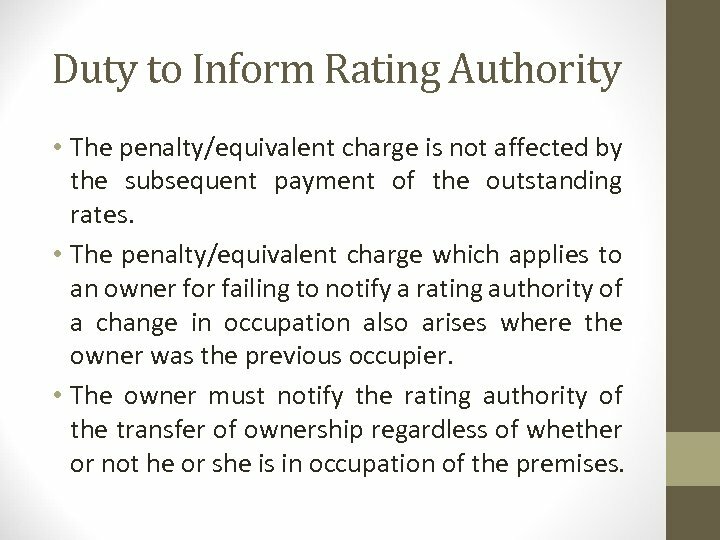 • The penalty/equivalent charge which applies to an owner for failing to notify a rating authority of a change in occupation also arises where the owner was the previous occupier. 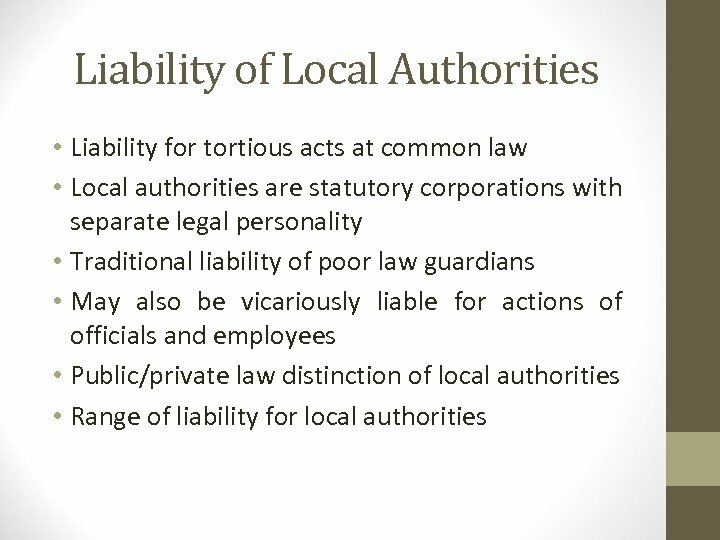 • The owner must notify the rating authority of the transfer of ownership regardless of whether or not he or she is in occupation of the premises. 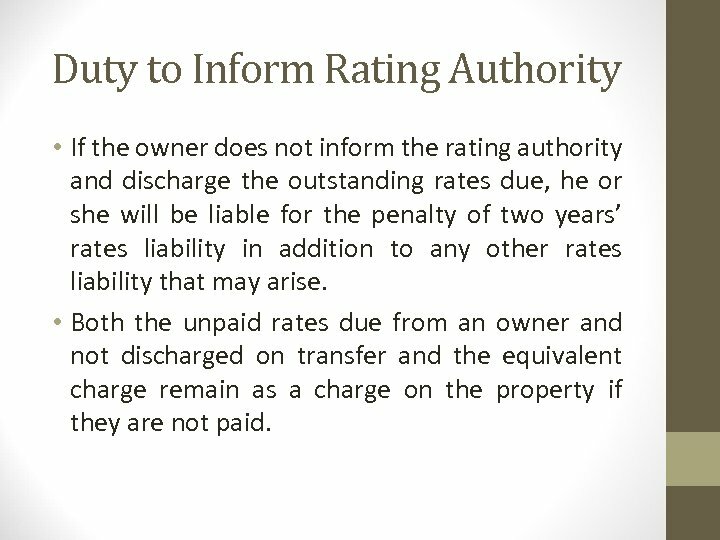 Duty to Inform Rating Authority • If the owner does not inform the rating authority and discharge the outstanding rates due, he or she will be liable for the penalty of two years’ rates liability in addition to any other rates liability that may arise. 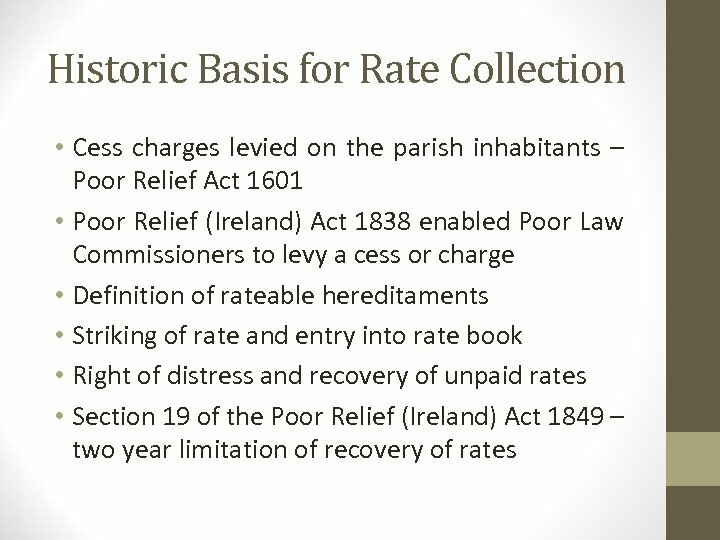 • Both the unpaid rates due from an owner and not discharged on transfer and the equivalent charge remain as a charge on the property if they are not paid. 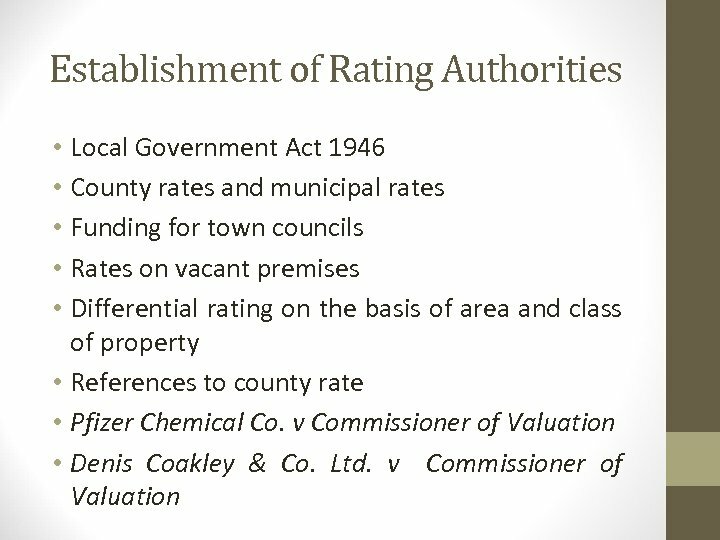 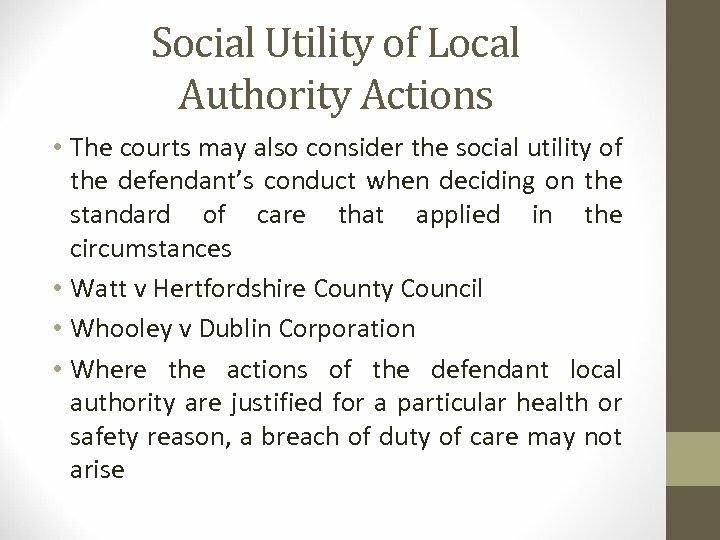 Duty to Inform Rating Authority • The liability for unpaid rates of a previous occupier does not become a charge on the property unless the occupier is also the owner of the property and the local authority can seek recovery of rates in the normal manner. 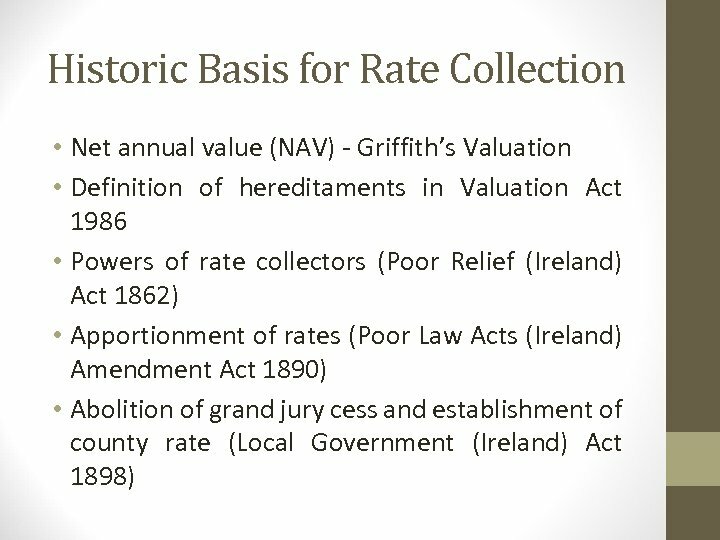 • Section 32(2) provides that any rates due from the owner of a property that are not discharged prior to the transfer of the property become a charge on the relevant property. 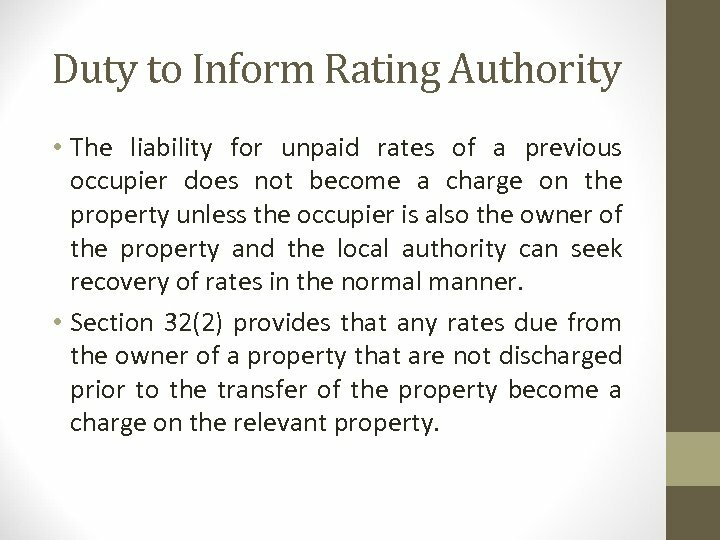 Duty to Inform Rating Authority • Section 32(5) provides that any charge or penalty which is due by an owner will remain as a charge on the relevant property. 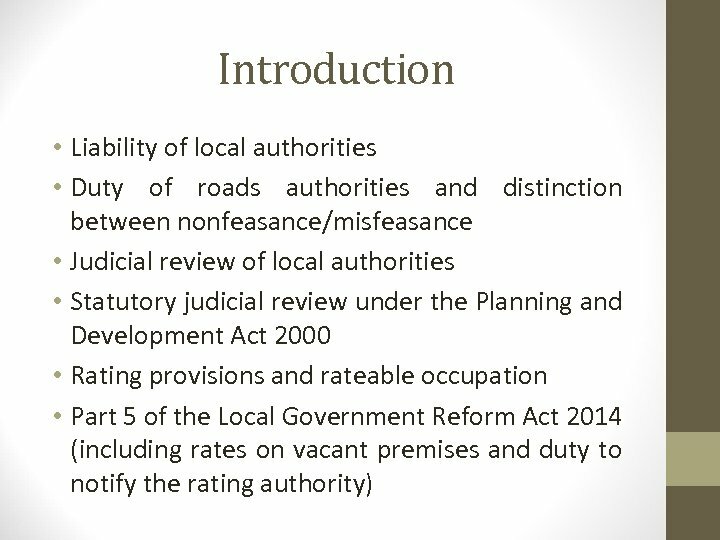 • This does not affect the liability of any previous occupier for outstanding rates for which he or she was primarily liable or the powers of the rating authority to collect any outstanding rates from the occupier or occupiers primarily liable for outstanding rates. 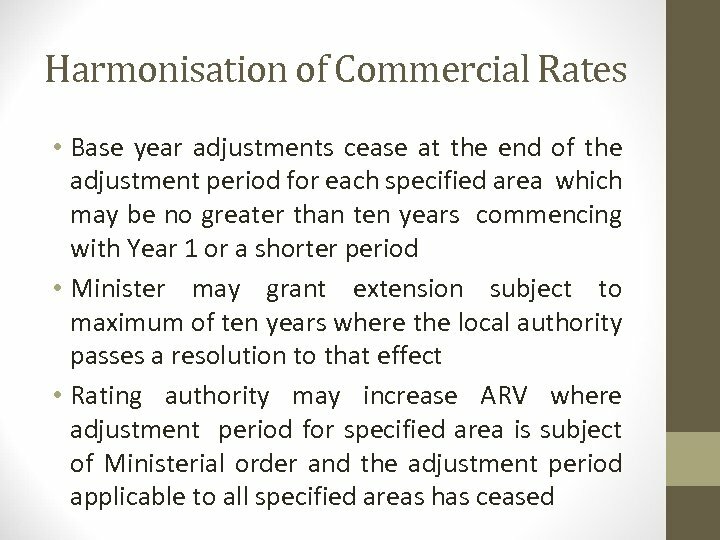 Duty to Inform Rating Authority • Any charge which is due by an owner of relevant property and which is not discharged will remain as a charge on the relevant property but the property will not retain that charge for a purchase in good faith for full consideration after a period of 12 years has elapsed. 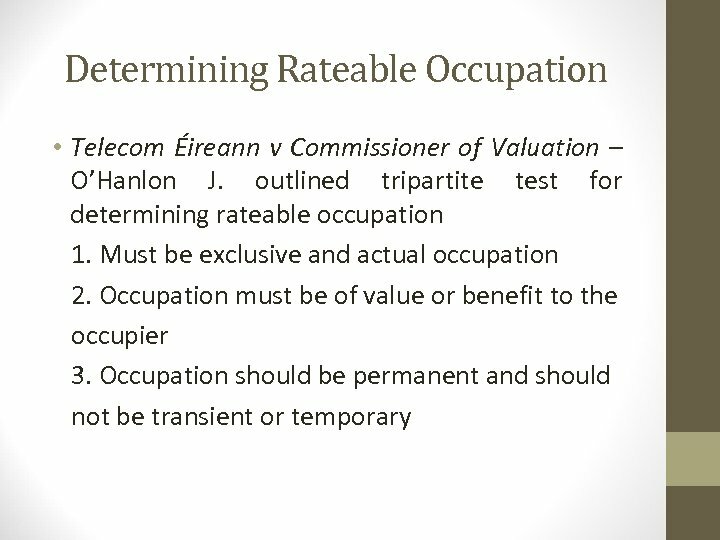 • The charge does not affect the liability of any previous occupier for outstanding rates for which he or she is primarily liable or the functions of a rating authority to collect any outstanding rates from the occupier who is primarily liable. 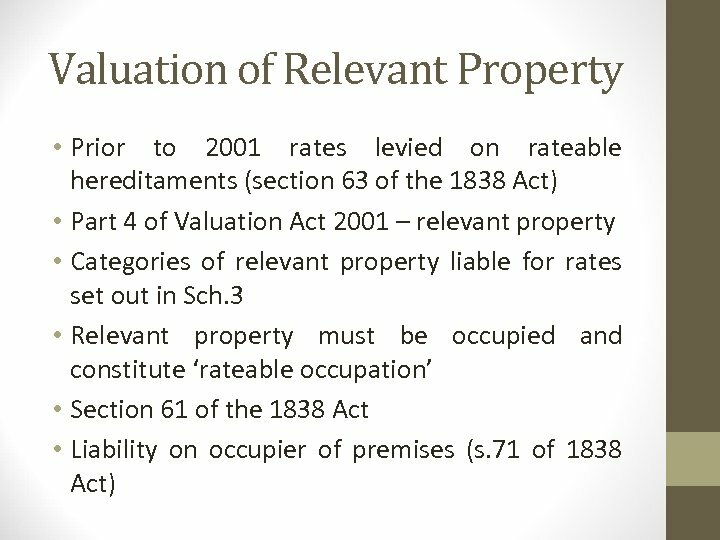 Recent Valuation Legislation • Valuation (Amendment) Act 2015 • Originally presented in August 2012 as Valuation (Amendment) (No. 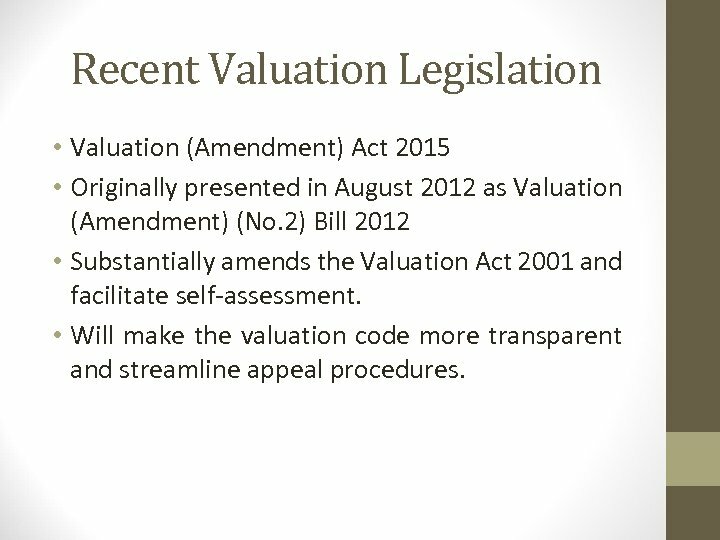 2) Bill 2012 • Substantially amends the Valuation Act 2001 and facilitate self-assessment. 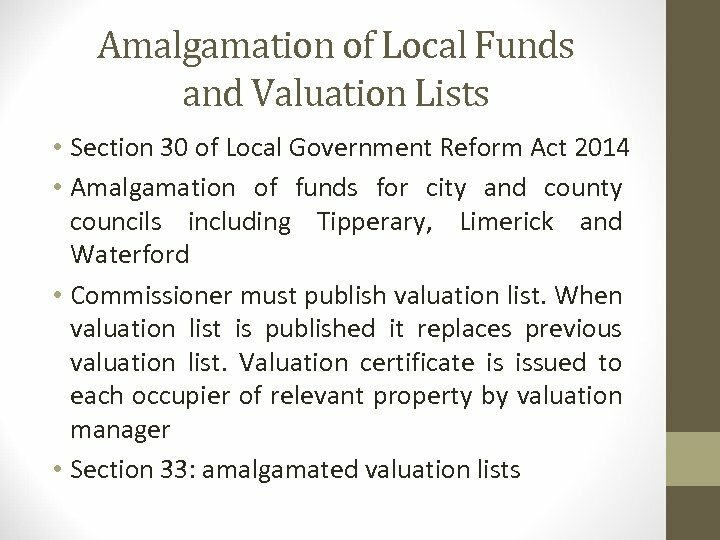 • Will make the valuation code more transparent and streamline appeal procedures.